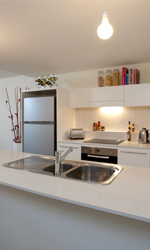 SL8’s generous, spacious apartments create a high level of comfort to accommodate the contemporary household. A variety of configurations provide the opportunity for families or sharing renters to live harmoniously. A home office can also operate unobtrusively. This combination of comfort and liveability ensures that all facets of your lifestyle are well catered for.